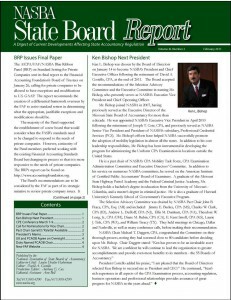 – “The process for referral of complaints from governmental agencies to state boards can be improved and NASBA is committed to developing and maintaining that process; however, we will need the assistance of the federal community in order to be successful. – “Where needed, NASBA will provide assistance to state boards that need assistance with their enforcement responsibilities. NASBA’s Government Agency Referral Task Force and Linda Biek, NASBA Director of Governmental, International and Professional Relationships, have been assigned to establishing a process to facilitate referrals from governmental agencies, President Costello told the Subcommittee.